We know you've probably heard this speech before but there are still some of you out there that haven't listened! Make sure you have recertified for 2009. If you need to find a clinic click here. Don't forget that if you need to get an assessment completed for upgrade or maintenance time is running out. If you have questions about the process let Larry Grimes know. He's anxiously waiting for your email with his BlackBerry in hand. 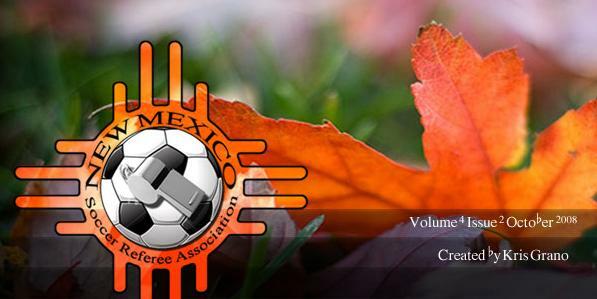 NM will be sending eight referees to Phoenix, AZ in January for the Region IV ODP Championships. If you'd like to be considered to participate please send an email to Kris Grano. More details to come so keep an eye on the website. Don't like something? Want to see more of something else? We need you to send us ideas for this newsletter. Maybe give a shout out to a referee you saw doing a good job. Or let us know of a local event. Whatever it is the only way to get it in here is to send it to Kris Grano. This weekend all across the state there will be a multitude of youth and adult soccer games going on. Spend a fair amount of time at the various venues and the sounds of people having fun will likely be shattered by some variance of "Hey Ref!" Many times this dissent doesn't rise to the level of abuse, but it is indicative of a growing crisis across the United States. Sideline behavior is getting worse and we all need to do something to change it for the better. We'll look at an interview of Brian Hall and also take some comments from our SRA, Doug Cotter, to dive deeper into this issue and search for ways to fix it. First let's consider why we even need to address it. The comments are heard far too often: "It's not our problem." or "It doesn't bother me what they say." But you see it is our problem. Maybe you can handle the comments made by spectators or coaches but that new referee has a bad experience and they don't come back. Or you've reinforced the behavior by not punishing it and next week it gets worse. The simple fact is that sort of negative behavior has no place in the game of soccer. None. The interview of Brian Hall addresses several elements of sideline behavior, including coaches and fans (read the whole article). He is a well respected referee and presents the method of "Ask, Tell, Remove" to effectively manage the poor behavior. He approaches it with respect for the game, which is vital. We want coaches to respect us and we need to give them the same respect. Doug Cotter expanded on Hall's interview at last month's ASRA meeting, calling all referees to action in combating the problem. Leagues all across the state are working on cracking down on outbursts which in turn allows people to just enjoy the game. We can and must work in cooperation with the leagues by enforcing the Laws of the Game, forwarding reports of abuse to the SRC and leading by example. Read more about this topic by clicking here, including some tips on how to manage those difficult confrontations.